​ALL IN UNDER 5 MINUTES! ﻿Why Our Device is Different? Service and Collision Centers as well as local independent mechanics endorse the AJON MOBILITY DEVICE! ﻿The Ajon unit can be installed in less than five minutes. The vehicle can then be moved by hand over speed bumps, dips, uneven pavement or any other undulations generally found in automotive repair facilities. ​is an extremely versatile, albeit simple unit that is applicable to the vast majority of vehicles on the road today. 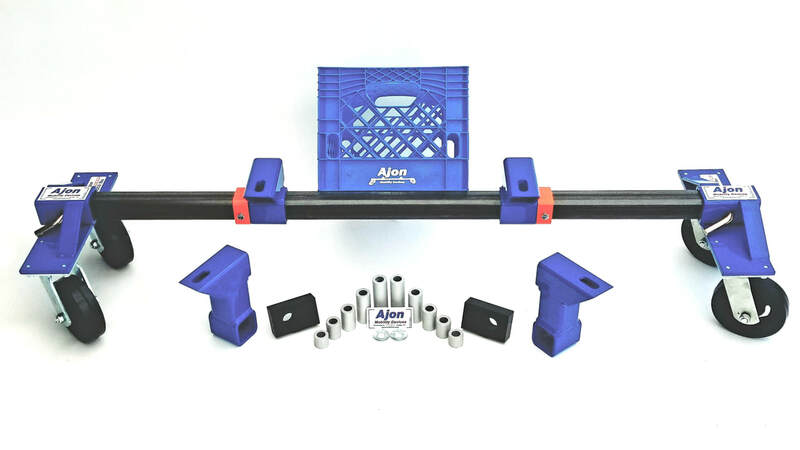 The Ajon is an economic, safe and efficient solution to one of the major problems facing virtually all automotive repair facilities, either mechanical or auto damage repair. The unit has been tested and refined to the point that it far exceeds all safety and durability concerns. The unit is simply designed and easily installed by any technician of any skill level. Our Device is Safe, Simple and Highly Versatile! This device offers the ultimate in versatility, safety and ease of implementation. The Ajon is ideal for contemporary vehicles that employ cradles, sub-frames and other powertrain/suspension support systems. These systems all employ a horizontal surface of which the Ajon will attach and become virtually a portion of the vehicle. The vehicle can then be moved safely and easily throughout the repair facility. The Ajon is manufactured and assembled totally within the US. It is fully guaranteed for any manufacturing or design flaws. It has been thoroughly tested and evaluated for its superior performance (full test reports are available upon request).